Have you ever curled forward and been asked to stay “long” in the spine? This isn’t something your instructor just made up, there’s actually a theory behind it. S. Piret and M. M. Béziers developed a system of Motor Coordination that has been studied and practiced by movement experts world-wide. According to their theory, the movement of rolling the spine is part of the work of the “straight system”. 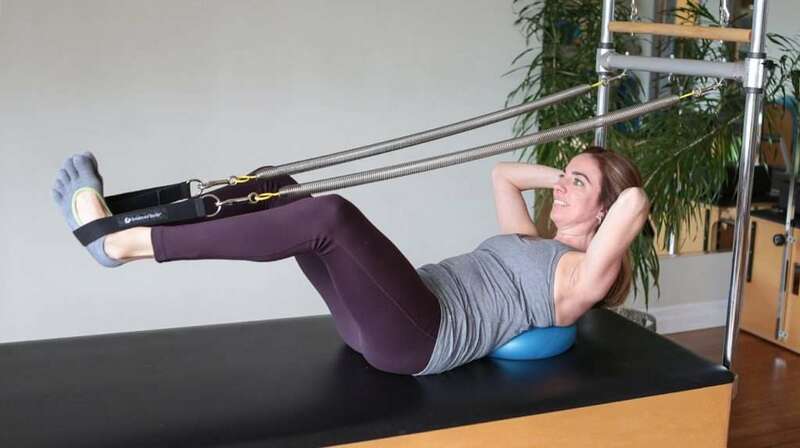 It’s a very important movement because it brings the flexors in a perfect condition of contraction but maintaining the ideal length of the muscles fibres. This is the most functional way to flex the spine without “losing” space at the front and back of torso. This rolling movement of the spine can happen from the pelvis or from the head or vice versa. The exercise I am going to show today works the rolling movement from the head to pelvis. The main goal of this exercise is to give better mobility for the thoracic spine and hips as well as a good stability of the lumbar spine and pelvis. This movement starts in the occipital-C1 joint, like a small nod. The muscular activation for this movement is centralized in the hyoid bone that makes the head to flex forward and slightly back toward the breastbone. This movement goes from the C2 to about T6. This way the first ribs are pushed back which causes the widening of the upper torso and breastbone slides down toward the pubic bone. I added the coach ball to facilitate the articulation of the upper spine and to increase the proprioception of the ribs pushing back as the spine flexes. The other part of this exercise is the work of the hip joints and lower limbs. It’s important to work the lower limbs like spirals that can transfer the tension from the hips to the feet and vice-versa. Based on the anatomy of the pelvis and the shape of the muscles, the perfect connection between the thighbone and the pelvic bone is made of a bit of external rotation of the hip. Some of the muscles that take the femur into external rotation cause the internal rotation of the tibia, creating the spiral that goes all the way down to the feet (ankles) that turn also into an external rotation. I added the long yellow springs just to increase the perception of the tension on the lower limbs and also to bring some extra challenge to the muscles that provide support for the core.